When I was at the market today, I noticed that Blackberries and Blueberries were on sale at 4 for $5.00. Since the price was so good and I love Berries, I decided to purchase some. I thought I picked up 2 boxes of each, but when I got home, what do you know but all the boxes were Blackberries. My intention had been to make a Blueberry Cheesecake for National Blueberry Day. Not wanting to go back to the market, my plans were suddenly changed. What to do with all those Blackberries? 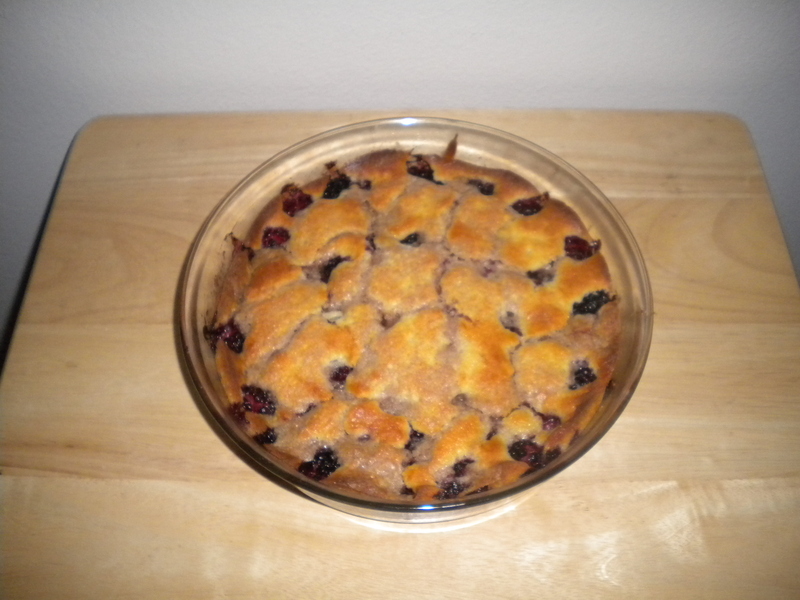 Since traditional breakfast food can get boring, I often like to make a fruited baked dish and what can be more delicious than a Blackberry Buckle for Breakfast? Even though the Buckle was probably improvised by our early settlers, this particular recipe comes from Oregon state where Blackberries grow in abundance, wild or domesticated. Buckles are similar to cobblers, but unlike a cobbler, the batter is put into the pan first and the fruit is added on top of the batter. When the dish bakes, the batter rises up around the fruit and seals it in. Cobblers usually are made with the fruit on the bottom with the dough (which is more like a biscuit dough) being scooped on top of the fruit. The difference in the consistency of the cake mixture of the Buckle is what makes the difference in the assembly process. Since biscuit dough for cobblers is considerably thicker than the batter (which is more cake like) for the Buckle, the Cobbler is made with the fruit on the bottom, since it is unlikely that it would rise up around the fruit if the fruit was on top. Since the Batter for the Buckle is thinner, it tends to rise up around and over the fruit. Buckle is fun to make and is an especially fun thing to make with your children. To a child, it would be like magic when the batter bakes and covers the fruit. Buckles, like Cobblers, can be made with most any kind of fruit, so it is good to use fruit that is in season. Fruit that is ‘in season’ tastes better in that it is probably picked closer to being ripe (if it is local) than fruit that is out of season. Out of season fruit, usually comes from another country in another hemisphere and because it has to be shipped, there is no way that it can be picked ripe. Also, if you purchase fruit that is ‘in season’, the price will be better also, as is the case with the Berries that I purchased. Buckles and Cobblers are dishes that are best eaten warm right out of the oven, but if you want it for Breakfast and don’t want to have to get up and make it and make everyone wait until it gets done, it can be made the night before. You can reheat it in the oven for about 10 minutes or you can microwave it for about one minute. There are not many things that I like to microwave, especially baked goods, but this is one dish that will not be affected detrimentally by the microwaves. 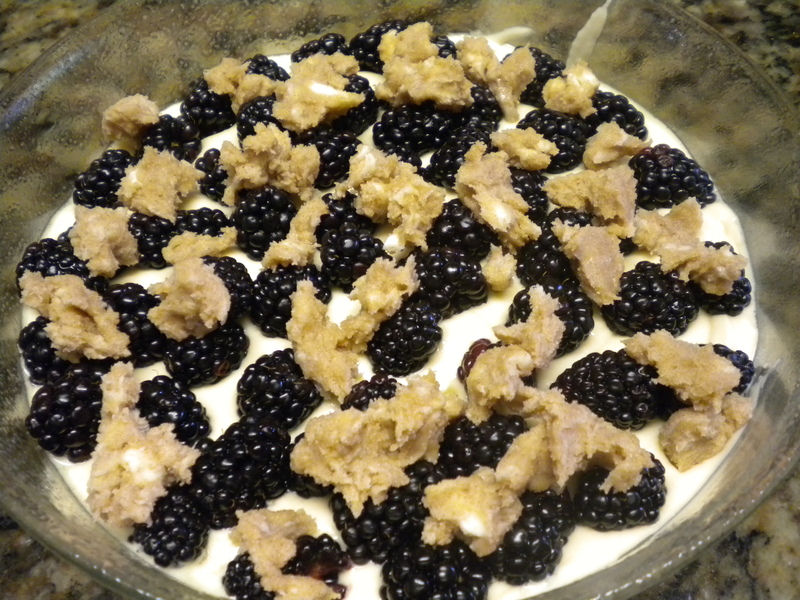 To make the Blackberry Buckle, first sort through the berries and pick out any that may be bad. Rinse them with cool water and gently blot dry with a clean dish towel or paper towels. Theoretically, you are not supposed to wash berries since they are like little sponges and can absorb too much water. This is the case with mushrooms also. You are just supposed to wipe them off with a damp paper towel. While this works fine for strawberries and mushrooms, it is almost impossible for berries like Blackberries or Raspberries or even Blueberries. Therefore, I just put them in a colander and rinse them with cool water and then gently dry them with a clean dish towel or paper towels. You do not want to leave any excess water on them because this in turn will affect your baked product. Adjust your oven rack to the middle position and preheat to 375 degrees. Lightly spray a 9 x9 baking dish with a vegetable spray/flour combination such as Baker’s Joy® or Bake Kleene® or butter it and then lightly sprinkle with flour. Be sure to shake out the excess flour. 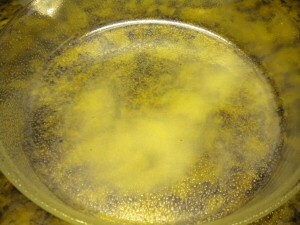 Make the Batter and pour it into the baking dish. 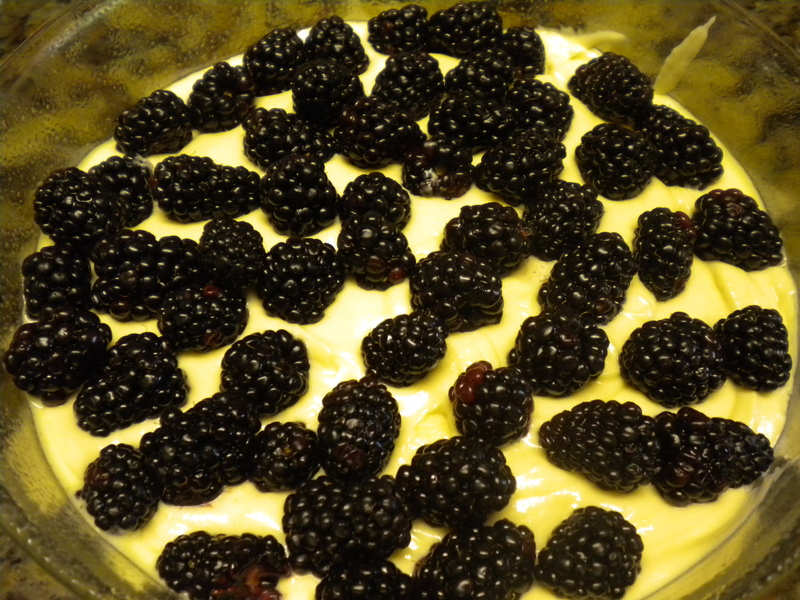 Place the Berries on top of the Batter. Make up the streusel topping and sprinkle over the Berries. If you make your Batter and Streusel topping in your food processor, make the Streusel Topping first and then transfer it to a small dish. Next make your Batter. This will eliminate having to wash the processor bowl more than once. If you look at the pictures below, you will see that the topping does not look like it was sprinkled on. It looks sort of clumpy. That is because I made the batter and did not want to wash and dry the bowl (or use a second bowl). So, it is much better if you make your topping first. It actually works either way, but if you do it as I did, you cannot sprinkle on the topping. You have to spoon it on in very small increments. Bake for 35-50 minutes (the finished product should be a dark golden brown), remove from the oven and allow to cool slightly before serving. This dish is great served with heavy cream, whipped cream or ice cream. It will provide 6 ample servings. Again, you can make it with most any type of fruit that is in season, except Bananas or Melons. For the complete recipe please see the recipe section of this blog. blackberry-buckle/ Try it and see how much your family will enjoy the Buckle! By the way, I still have two boxes of Blackberries left. We could just use them for eating out of hand, but this probably won’t happen, so I will most like turn them into turnovers. I love puff pastry, but don’t especially like to make it. Since we have some prolific fruit trees in our yard, I frequently make turnovers and freeze them to bake and eat as needed. Making puff pastry can be fun, but time consuming it doesn’t always turn out as it should. Therefore, I keep a large box of puff pastry (that I purchase at Smart & Final – or another restaurant supply that you may have in your city) and pull out the sheets as I need them. Once I cut the dough and place the fruit inside and seal the edges, I freeze the turnovers in a single layer on a cookie or baking sheet. Once they freeze, I then put them in plastic bags that are labeled with what they are along with the date and then put them back into the freezer. This way, you can just bake them as needed. Since turnovers, especially when made with puff pastry, taste best just out of the oven, just bake what you are going to be eating or serving that day.